Hey all! I’m happy to say Bastion should be coming out sometime next month — early to late next month. No release date yet, but the book is out of my hands for the most part. It’s going through a long editing chain. First my dad (who always gets it first), then my first copy-editor, then a couple of proofers, and then three of my beta readers. After those six people have gone through it, and one final read through by me (Kyle West), it will finally be fit for publication. I’m writing this to let you know that you don’t have long to wait at all. Thankfully, the gap between book one and book two is going to be far less time than the gap between the end of WC and the beginning of XS. As I suspected, it took that long to develop the world and get a feel for the characters. Now that the world is developed, the novels should be coming out in a more timely manner. Actually, come to think of it, Prophecy was released at the end of March, and if Bastion comes out in early June, that’s closer to two months than three. I’d love for all my books to come out in that time frame, and I really do hope it works out that way! I’m pretty excited, and as always, it’s great to have it out of my hands. There is still work to do, but the lion’s share is done. My next project will be fixing things other people find, and after that, it will be time to format and publish! 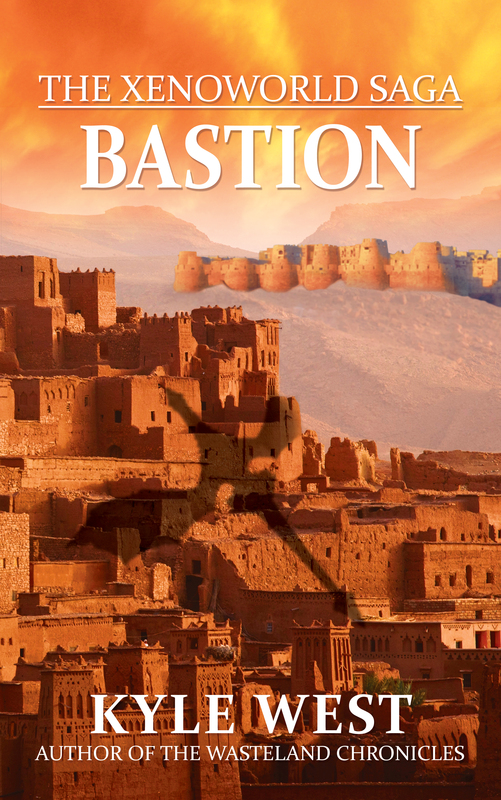 Cover Reveal for Bastion! Are you stoked? Not nearly stoked enough!